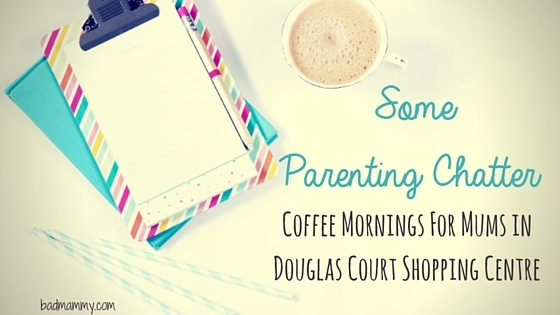 This February, Douglas Court Shopping Centre will host â€œCoffee Mornings for Mumsâ€ â€“ a series of informal discussions and chats over coffee, hosted by parenting experts and bloggers for mums and mums-to-be. Every Wednesday morning at 11am, mums are invited to go along and meet other like-minded women and their â€œsmalliesâ€ for chats in a number of the Centreâ€™s coffee shops. The series kicks off on Wednesday, February 3rd in Oâ€™Brienâ€™s, where Marie Barry-Murphy, founder of TheBeautMum blog and co-director of the #Cloggers Blogger group, will discussÂ Getting Fit Post Pregnancy. As a mum of four in her 30s, Marie will discuss her own fitness routine and how she got in shape for her first marathon last year. Marie is also a qualified personal shopper, stylist and makeup artist, and will share her tips on combining it all. On Wednesday, February 10th in BBâ€™s Coffee & Muffins, Dr Amy Herlihy will discuss nutritional needs for mums, both pre and post pregnancy. Dr Herlihy is a GP specialising in nutritional medicine. Her clinic â€˜Special Kids Medical Clinicâ€™ helps parents and children manage their medical issues using dietary changes and nutritional supplements. OnÂ Wednesday, February 17thÂ in Oâ€™Brienâ€™s it will be my turn, on the topic of mental health and self-care in pregnancy and post-partum. I’veÂ written previouslyÂ on the topic and consider myself anÂ advocate for mental healthcare, in particular regarding postnatal depression. I’ve gotÂ direct experience with living with mental illness, having been diagnosed with postnatal depression after the birth of myÂ son. This is a topicÂ IÂ feel women need to be able to talk to each other about as it can be an incredibly lonely and isolating time. Despite the serious content of myÂ talk, IÂ promise it will be a tad more light hearted while making sure the message gets across! The â€œCoffee Mornings for Mumsâ€ series finishes up on Wednesday, February 24th in BBâ€™s Coffee & Muffins with Eimear Hutchinson, founder of parenting and lifestyle blog, The Two Darlings, discussing beauty routines for mums. Eimear is an engineer, mum, wife, blogger and beauty columnist with The Irish Times and is currently taking some time out to mind her two small girls. She will be chatting about beauty tips and tricks for busy mums, multitasking products, time saving tricks, beauty routines for quick makeup application and for good skincare. She will also talk about some of the Irish beauty brands and businesses that will be featuring in her Irish Times column over the coming months. All mums are welcome and there is no cost to attend the coffee mornings. You can drop in for any or all of the sessions, and there is no need to book in advance. For more information visit www.douglascourt.ie or find them on Facebook and Twitter. 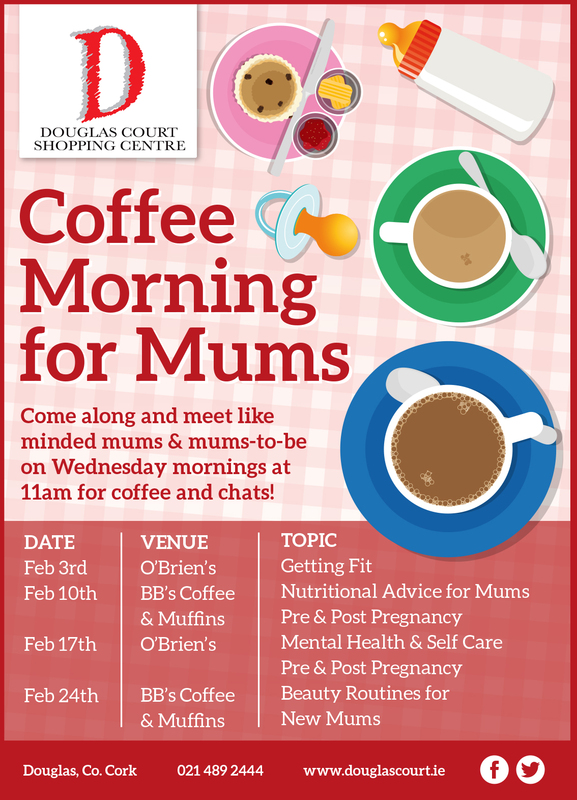 Hi I went along today wed 3 Feb douglas court sc but obriens was so busy, with no acknowledgement of mommies meeting etc I left as no space to sit down with buggy……I didn’t know if mommies meeting was on as no one acknowledged me as to meeting on and was too shy to ask. It would have been most helpful if some one was there to welcome the mommies. As was no room even to sit….. Thanks for bringing this to my attention – I wasn’t actually there at the talk today as I was unable to attend but I agree that it doesn’t sound like it was a good experience. I’ll give a shout out to the organiser and mention it for the next one as the last thing we want is for any Mammy to feel unable to join in.